Glam Morena: Review: Eyeko Graffiti Eyeliner Pen + Line & Shine. 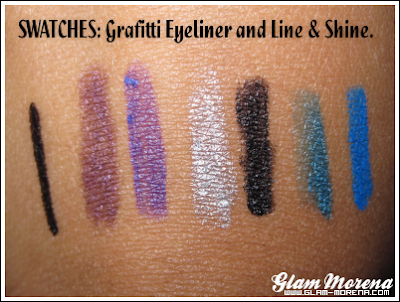 Review: Eyeko Graffiti Eyeliner Pen + Line & Shine. Happy Monday! I hope everyone had a lovely Easter weekend. I have a review of some Eyeko products I received last month. I was sent the Eyeko Line & Shine Duo Colour Pencils and Graffiti Eyeliner Pen. EYEKO HAS THE CUTEST PACKAGING! Don't you agree? L to R: Graffiti Eyeliner, Super Star, Rock Star, and Pop Star. Graffiti Eyeliner Pen: I really liked this eyeliner pen. It's a nice jet black. Application is very easy and precise. I noticed when I used it on my lower lash line that it tends to smudge after a while. If you were to not close the top all the way, it's bound to dry up. 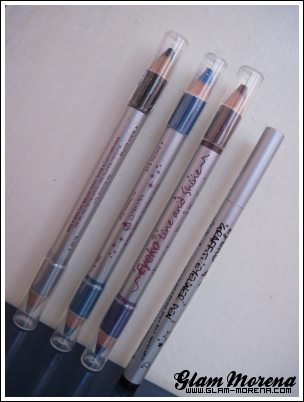 Eyeko Line & Shine Duo Colour Pencil: I am in love when these! I always find eyeliners that are pigmented on my hand, yet show up dull on my eye. The pigmentation you see on my hand, is the same pigmentation you'll get when applied to the eye. The pencil itself is not hard, it's glides on smoothly. These did crease on my lower lash line as well. HAVE YOU TRIED ANY OF THESE EYEKO PRODUCTS? Disclaimer: Eyeko provided me with the products mentioned in this post. I've never actually tried this brand, they're kinda pricey! Iv enever tried them, but that popstar looks like my kind of color. Those looks pigmented and being that it glides on smooth, I might need to try them because I need a cheaper alternative from my number one favorite UD 24/7 eyeliner. oohhh I like how dark that black is! I really liked that blue color. Very pretty! soo pretty i'm loving the Pop Star one.. i want! Great swatches Rai. The black graffiti eyeliner looks really pigmented - something I would love. And Rock Star is such a pretty purple shade.